I am sending you the first3 half of the page proofs4 today, the rest will follow in a few days. Please send me the proof of the dedication page as soon as possible. You remember the text is: For Jan5, because he likes narrative. I’ve never seen a proof of it yet. I like the jacket design6 fairly well, but I agree with you that it’s too fussy—too much like an illustration. I had hoped for something simple in design and brilliant in color. The blue blue behind the lettering seems to me rather dark and heavy for a jacket. I enclose a little sketch which might give a suggestion—I have no crayons here to indicate the colors. If you’ve no time to experiment further, I will be satisfied with this sketch of Mr. Fall’s7, however. Don’t hold anything up in order to send me proofs of the jacket. If you are satisfied I think I will be. 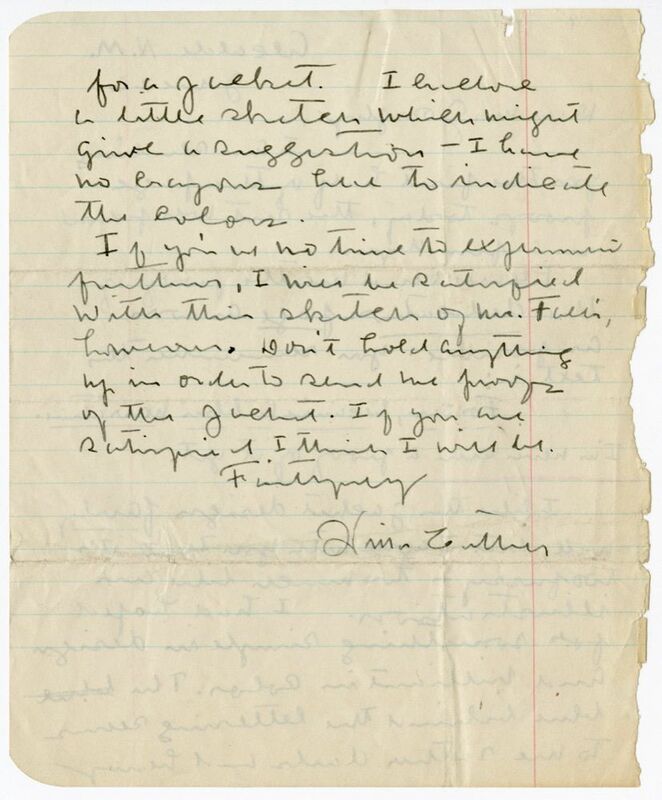 The year of this letter is derived from Alfred A. Knopf's publication of the first edition of The Professor's House on 4 September 1925. After printers incorporated corrections made on the galley proofs, the typeset text was configured into pages for additional proofreading and correction. 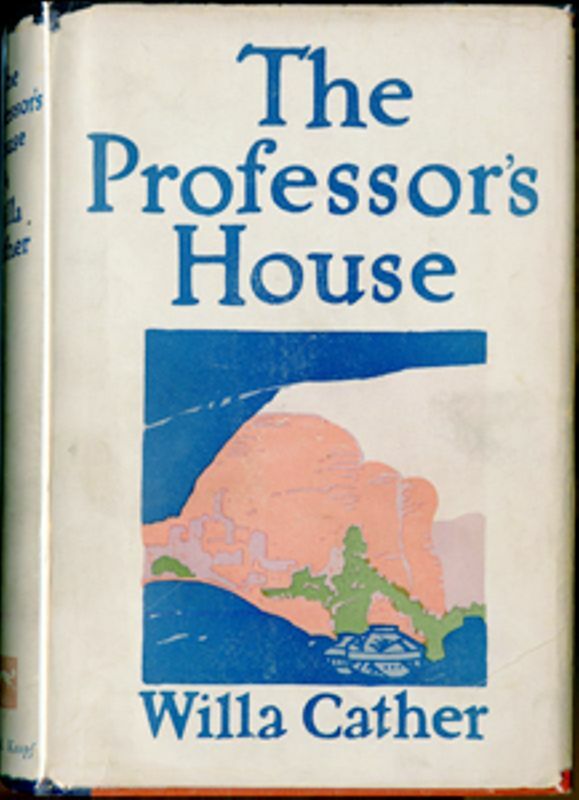 The dust jacket of The Professor's House (1925) as published. Falls, Charles Buckles (1874-1960). American artist and illustrator. Born in Fort Wayne, IN, in his early twenties Charles Falls worked in Chicago, IL, as an architect’s draftsman, as a sketch artist for the Chicago Tribune, in advertising, and as a free-lance magazine and book illustrator. Around 1900 he moved to New York City and developed the bold, graphic style for which he became known. Falls incorporated woodcuts into his designs and is best known for his World War I propaganda posters and for the ABC Book (1923). At his most popular in the 1920s, his illustrations appeared in Collier’s, Everybody’s, Adventure, and Cosmopolitan, and he also designed book dust jackets. 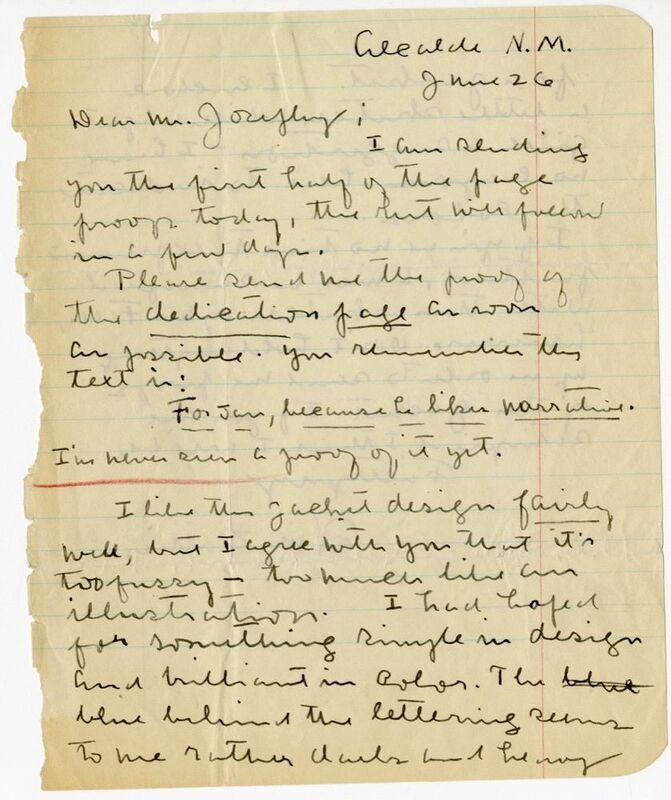 Cather did not like the jacket he designed for The Professor’s House (1925).